"Le Tango (The Tango) "Double Portrait Of Herman Dietz"
Provenance: Galeire Laurent Teillet, Paris, stock number 1069DCollections:Collection Dominique Bert, Le Louvre des Antquaires: Jean Cocteau Exhibition 23/3/2007 - 22/4/2007 - Illustrated in the catalogue number 6, page 14. This work is included in the section �Souvenmirs d�enhance"
Note: Note: For some strange reason Cocteau did sign a number of his drawings made at this period with the pseudonym �Jim� and this is recorded in the Dermit certification. There is an element of collage in the piece (visible in the right hand of the violinist). 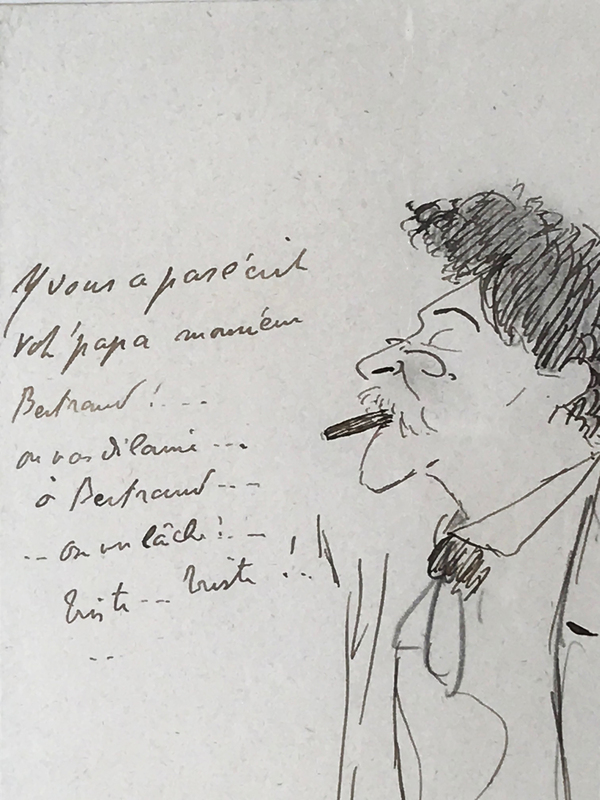 The drawing has much of the characteristic of a caricature and in one interpretation, an amusing statement of the finale where the lady �tangoist� collapses into the arms of her friends after an exhausting and energetic dance.At the time this drawing was made Cocteau was heavily involved with various personalities in writing and producing ballets. In 1914 he had tried to interest Stravinsky in a scenario for a ballet that would present the biblical King David as a fairground parade. Hard at work on �Le Rossignol� and fully aware that Diaghilev would not look well on collaborations he had not authorized Stravinsky resisted Cocteau�a overtires - much to the poets disappointment. This rejection resulted in Cocteau working with Satie who described him as �l�homme Aux Idees�. 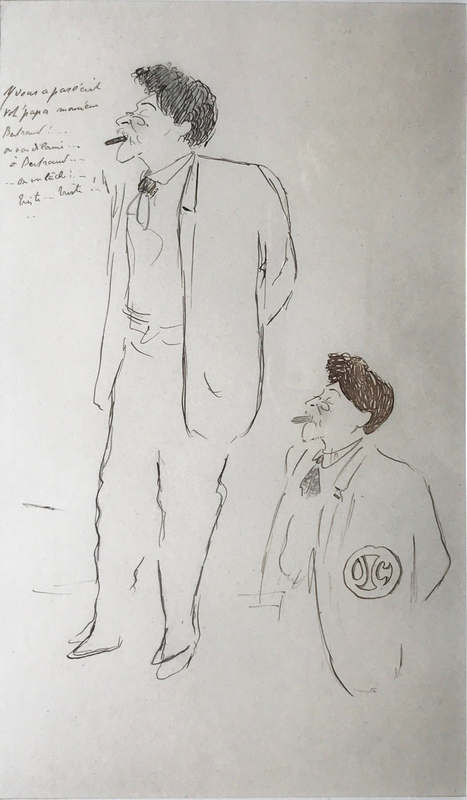 No doubt our drawing, made during the time of the First World war, was part of the creative impulses going through the poet and artist at the time. The Tango played an important part of the dance routines employed at this period and our drawing shows an amusing scene of this genre. Authentication: A certificate from Edouard Dermit, the artists adopted son, dated 10/10/1986, comes with this item.